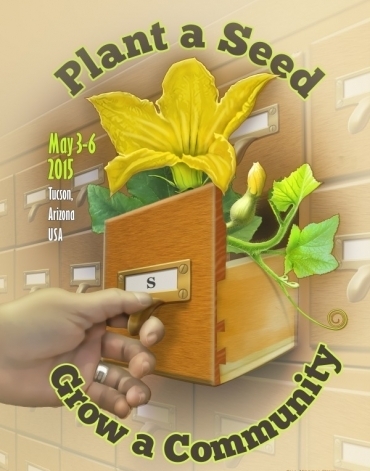 On May 3-6 I attended the first International Seed Library Forum in Tucson, Arizona. This event brought together many of the movers and shakers in the seed library world that I wrote about in Seed Libraries and we all got to meet face-to-face! It sure beats communicating by email, which is what I did to have each one confirm what I had written about them or their project in my book. As soon as I arrived at the hotel I met Rebecca Newburn, the person who propelled the seed library movement into what it is today by putting all the information on the Internet in a way that it could be easily replicated. She is also the one who keeps the Sister Seed Library list up to date. That List was a tremendous help to me when I was writing Seed Libraries. My friends Ira and Irena from Southern Exposure Seed Exchange were already at the hotel, as well as Cary Fowler, special adviser to the Global Crop Diversity Trust. Gary Nabhan arrived in short order with a van and took us to visit the San Agustin Mission Garden. Although Gary gave credit to others for organizing this conference, I believe it was his idea and it couldn’t have happened without his guidance and connections. 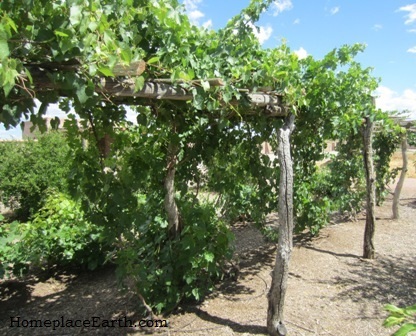 The San Agustin Mission Garden is a living agricultural museum of Sonoran Desert adapted heritage fruit trees, traditional local heirloom crops and edible native plants. One of the many important crops grown here is White Sonora wheat, perfectly suited for tortillas, among other uses. It was an export crop for Arizona in the l9th century, providing wheat for flour that fed armies from both the North and South during the Civil War. As food systems changed to an industrial model White Sonora wheat was only grown by a few farmers. Through the efforts of Native Seeds/SEARCH, White Sonora wheat is being brought back into commercial production. Living in Virginia with an annual rainfall of about 44 inches a year, it was really interesting visiting Tucson where the average rainfall is about 12 inches annually. With those thoughts of wheat attuned to the Arizona climate, you can begin to understand just how important it is to have seed libraries to preserve the varieties that do the best in individual regions. We need to discover what grows best in our own areas and keep those crops and varieties available and in production locally. A few state departments of agriculture have decided that seed libraries need to be governed by the state seed laws and that is what brought us all together that week. Two lawyers, Neil Thapar from the Sustainable Economies Law Center and Neil Hamilton from Drake University Agricultural Law Center provided guidance on legal matters throughout the Forum and particularly in drawing up the Joint Resolution in Support of Seed Libraries. That document will help those who are working on legislation to make seed libraries exempt from seed laws. I met Betsy Goodman of the Common Soil Seed Library who has been active on that issue in Nebraska. I was able to attend the session concerning establishing an International Seed Library organization. Thanks to Rebecca Newburn and her Cool Beans newsletter (May issue), you can view the minutes of the meeting here. You will find me second from the left in the panoramic photo. Information about Cool Beans is available at seedlibraries.net where you can sign up to receive it and stay in the loop about seed library issues. The two panels I participated on were Lessons Learned from Seed Lenders: Evaluating Seed Library Outreach and Educational Needs and What’s Next for Seed Libraries. Other sessions delved into additional means of securing community access to seeds, such as SNAP and gleaning; providing seed access to beginning farmers; working with non-profits; and working with school and youth garden programs. Seed Savers Exchange was represented at the Forum by John Torgrimson and Toby Cain. It was good to see Bill McDorman of Rocky Mountain Seed Alliance again. Bill and his wife Belle wrote the Foreword for Seed Libraries and operate Seed School which I attended last November. Seed Story Broadcast van with Chrissie Orr. And then there was the collection of stories. There is a photo in Seed Libraries of the Seed Story Broadcast van and, don’t you know, it was there! I was happy to see it that first evening when we arrived at the Loft Cinema for a seed swap in the parking lot and later inside to view Seeds of Time, starring Cary Fowler. There were so many people to meet during the seed swap—people I had corresponded with while writing the book, people I had corresponded with since writing the book, and people seeking me out who had read the book. Several people told me they had been reading Seed Libraries on the plane and I had the cartoon image in my head of airplanes converging on Tucson with the passengers all reading Seed Libraries! It was so much fun talking with everyone. 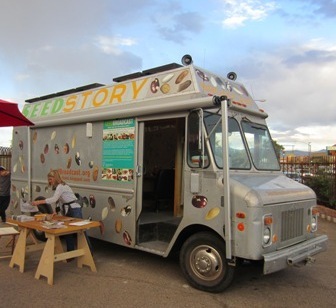 Jeannette Hart-Mann and Chrissie Orr collect seed stories and broadcast them from their Seed Story Broadcast van, which is an opportunity to collect art as well as stories. It was wonderful to actually meet them. They later parked the van outside the Pima County Library and whenever I went outside during the breaks I would hear them call my name to come and leave a story, so I did. 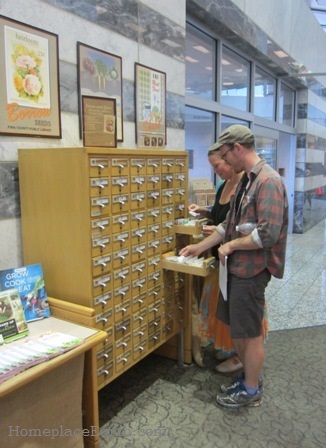 Matthew and Keri checking the selections at the Pima County Seed Library. The Pima County Public Library hosted the Forum at the Joel D. Valdez Main Library. When I was researching for the book, people told me they were helped by information provided by the Pima County Seed Library resources. Justine Hernandez was instrumental in making that happen. Gary Nabhan announced that this conference was indeed international with five countries represented—then participants spoke up, adding two more to the list. I met more Canadians than I expected, including Matthew from Victoria Seed Library in Victoria, British Columbia, Keri, an urban farmer from Saskatchewan, Jacob from the Toronto Seed Library, and Rupert who grows seeds for Salt Spring Seeds and operates Kairos Botanicals. There are too many new friends to mention, but I value my visit with each of them. Wanda, local to Tucson, was very helpful to those of us new to the city, popping up with good advice when we needed it, such as places to eat. As things wound down at Native Seeds/SEARCH on the last day she gave me a pink rock in the shape of a heart that was gathered from around Tucson. What a nice treasure to have to remember everything that happened over the past few days. There was no admission fee to this conference thanks to support from the W.K. Kellogg Foundation, the Amy P. Goldman Foundation, and the Arizona Library Association. This event was presented by a collaborative effort of: Community Food Bank of Southern Arizona, Edible Baja Arizona magazine, The Friends of Tucson’s Birthplace’s Mission Gardens, The Loft Cinema, Mercado de San Agustín, Native Seeds/SEARCH, Pima County Public Library, and University of Arizona. Additional co-sponsors included Greenhorns, the National Young Farmers Association, the Seed Library Social Network, Seed Savers Exchange, and the Rocky Mountain Seed Alliance. The artwork was created by Paul Mirocha Design. To Gary Nabhan who first called me to see if I would participate, to all the folks who made it happen, and to my many new friends, THANK YOU for a wonderful few days in Tucson! Seed libraries are thriving and the groundwork has been laid to make sure they stay that way. Hear my seed story at Seed Broadcast at https://soundcloud.com/seedbroadcast/cindy-conner-talks-about-cherishing-the-gift-of-seeds. Learn more about the International Seed Library Forum at Mother Earth News.